This short and direct 132 mile route from Brighton to central Paris is a carefully thought out route, utilising a mixture of good fast direct roads, and small country back roads. We have taken time to consider our route into Paris to make the ride as enjoyable and pain free as possible! Once off the ferry in Dieppe and away from the familiar sights of the Sussex coastline, our ride through France takes us through the attractive French countryside. We’ll glimpse poppy fields and charming French villages. 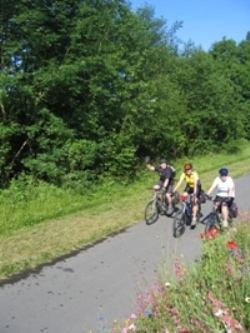 We cycle on through the historic town of Rouen and then on to our approach to Paris, here we really get going! It’s downhill into Central Paris and we’ll eventually pass right beside the impressive Arc de Triomphe and swoop along the grand Champs Elysees to our finish point bang in the middle of the excitement of Paris. The evening is then yours to enjoy; celebrate in this beautiful and culturally vibrant capital. You are accommodated in Paris and the following day (aching legs permitted!) you are free to sample the delights of city before catching the Eurostar train directly back to Ashdown and coach to Brighton. Your bike will have a head start on this journey and you will be reunited back in Brighton. Transport to/from Brighton start/finish points, Lunches and dinners. Pre Event Accommodation in Brighton.